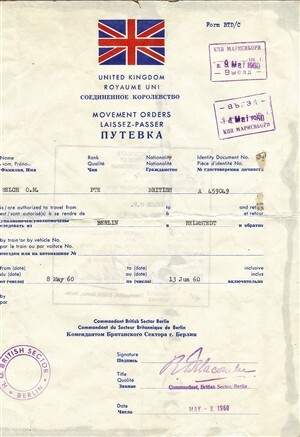 Four of us used to do a Train Guard on the overnight troop train from Berlin to Hannover, returning the following night and we had to have this type of document, in the keeping of the Train O.C., to get through. This is my leave one and should have been handed in at Marionborn, the Check Point. I haven’t got a clue as to how I managed to get hold of it, but it is a prized possesion. Whilst we were stopped at Marionborn and the Train O.C. was with the Soviet Officer checking our documents, we were leaning out the opposite side windows swapping cigarettes for Soviet cap badges with the Guards on that side, usually only two, one each end the train. They would furtively look around, put their hand in pocket, move nearer the train and hand up the badge for a packet of cigarettes. Interesting site. I have my father’s ??????? dated 26 March, 1975. He was a Warrant Officer, RAF Wildenrath. Four of them went to West Berlin for the weekend. I recall he was not best pleased having to travel in uniform. I had left home and RAF family life 10 years earlier and was working in the UK and, in 1976, drove through West Germany on business with a colleague. We had to visit a publisher in West Berlin and so did the Helmstedt-W/Berlin autobahn. Not a relaxing trip (but then I guess it never was). As civvies we were not so familiar with the form, but had been told to keep in mind the time constraints of the crossing, and to avoid “Hauptstadt der DDR” road signs as these, of course, would have led us to East Berlin. At 6pm on a cold January evening we arrived at the East German control point which would allow us access to West Berlin. There was no-one there; no VoPo’s, no manned offices, no life – nothing. But there was a chain across the road. What to do? I got out of the car undid the chain. We drove through and stopped again. I re-fastened the chain and on we went. This caused me serious worry for the whole 36 hours we were in West Berlin. But at the end of our visit we got out OK. Except this time a VoPo walked around the car to inspect us. As he got to the rear of the vehicle my colleague, the driver, decide to wash the windscreen. We were stationary of course so the stream of water flew over the car and hit his head! As he bent to the window to tell us to go, the water drained off his fur hat. I recall his absolutely deadpan expression. My experience was the same, exchanging cap badges for cigarettes with the Russian guards.it was very exciting at the time.that was before they built the Berlin Wall.